Discussion in '1st Generation: 2002–06 R50, R53 & 2004–08 R52' started by fishmonger, May 14, 2018. Not really a build thread, but I think I will be doing several jobs on this car over the summer and fall, so it needs a place separate from the Daily Driver electric blue thread. The fun began yesterday with the long overdue Clear Bra removal from the front bumper. I've dreaded this day and have put off the project year after year. The top bumper layer of the film was beginning to crack when I bought the car years ago, but when I tried to peel it off, it just crumbled. Now, years later, it's only gotten worse. I invested in some nice plastic razor blade scrapers and a fresh bottle of Goo Gone, pulled out the Harbor Freight heat gun and cranked the garage stereo to finally tackle this thing. 3 hours later I had half the lower bumper and 25% of the top edge done. This will need a few more long and boring evenings. The interior of the car still has some sort of chemical outgassing smell if left closed overnight. I've steam cleaned every surface for hours and no success. Cannot locate the source with my nose up close to plastics or carpet so I guess I will need to tear into the interior a lot deeper than I have so far. Seats will come out, maybe even the entire carpet. While at it, I may wire in some upgrades to the cheesy "Harman Kardon" speakers that may be better than base audio, but omg are they bad compared to what I have in the other car. When I do that I will also testing how to disable all seat airbag and belt tensioner warnings - this car will eventually see racing seats and harnesses with roll bar. Nice work as slow and steady is the way to go. Done be afraid to use a little acetone or lacquer thinner on the glue with a rag. It will break down the glue much faster than goo gone. Just don’t let the rag sit on the paint for 5 minutes and you will be fine. 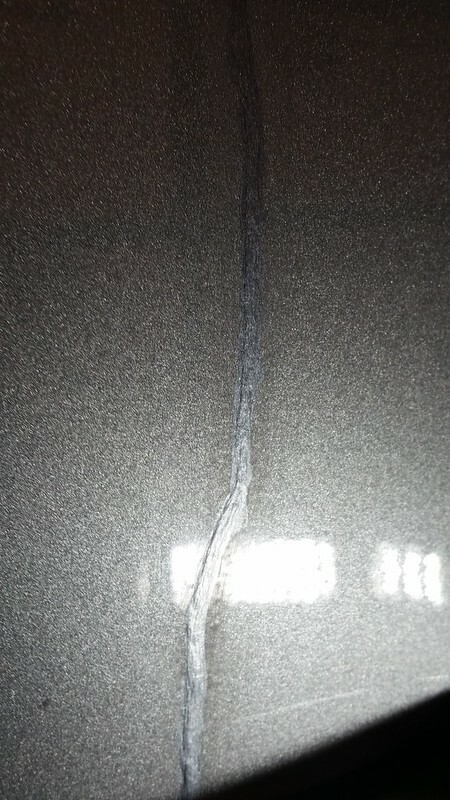 Just soak a rag and wipe off the glue like you remove old wax and you will save a lot of time and scraping. Just like I remove old wax? I let the weather do that May take a little longer with the glue, though. Heat and Goo Gone combined seem to be the recipe for quick initial progress, then the rest is really rag and whatever chemical works best. I have to try the Acetone. 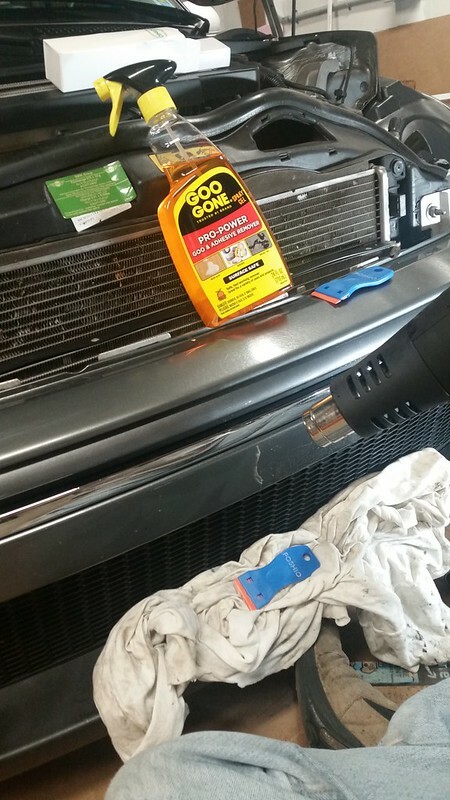 Keep using what I have to rinse out intercoolers, so I may not have any in the garage right now. I believe that WD40 works also. Got it all off. Now patching up some scratches. Will add some more interesting updates when the exhaust gets swapped. I don't have a lot planned for the car this year, but there will be a few things here and there, which I'll keep adding to this thread when I get to these things. I'm considering a full HID projector upgrade, but need the other car fully road worth for a while before I get into that. Another job will be a full paint correction and ceramic coat. It will be the first time the buffer touches the paint on that car. The Electric Blue daily driver will soon go on jack stands again for some front end work and perhaps a brake upgrade, custom intake and some other tweaks. Nothing huge left to do on that car, but some bits and pieces have yet to be overhauled. The clear braw thing to me is interesting. You spend a good deal of $$ to put it on (not you, I know it was already on the car).. but others. If you are going to hold the car for more than a few years, I'm almost in the mindset of drive the car and then re-paint the front when needed. About the same cost. That said, I have a good painter who is reasonable so my perspective maybe. Either way - great job getting that off. Looking good. 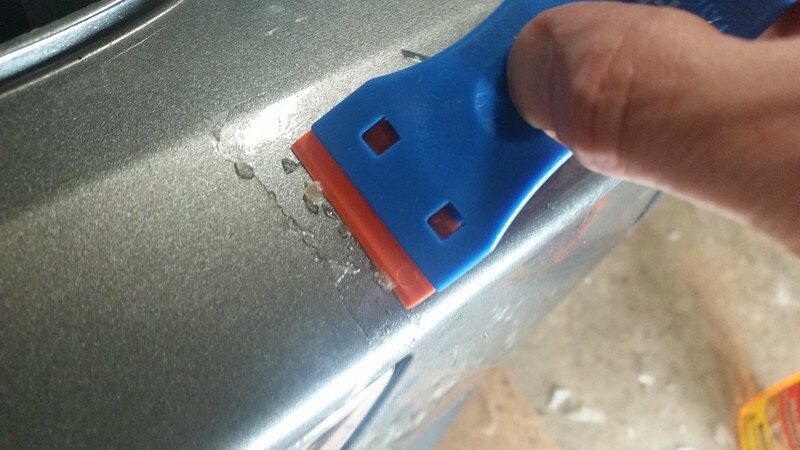 If you plan to rip the stuff off every 3-4 years and don't mind the that plastic shine rather than paint, it will do the job and it should not take so much time to get off. It did protect the paint on the bumper of that car for 100,000 miles wherever it was covered. 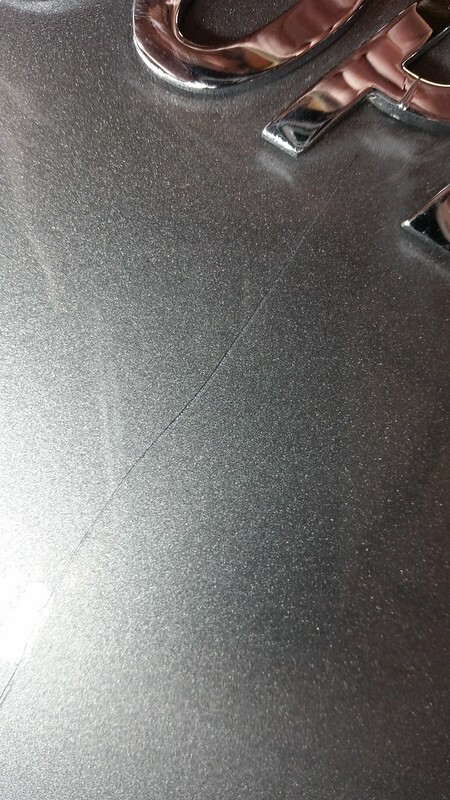 You can see the line where the original owner had it on the front edge of the hood - paint fade is different. I'd do the entire hood to avoid that, but now it is getting even more expensive. I was thinking if I ever found a car in a color I don't like but otherwise checks all the boxes, I'd wrap it in a different color. 4-5 years and $1k in material isn't such a bad gig and I am sure it'll protect just as well as the clear stuff. However, I barely drive my cars (first gas fillip since Oct. 9 yesterday - 200 miles and 8.9 gallons), so spending money on this stuff makes no sense. I spend enough on insuring cars I barely drive. My operating cost per mile driven is easily 90% insurance and registration. Spending hundreds of dollars on a plastic paint protection on old cars, only to rip off every 4 years before it gets too darn brittle again isn't going to happen. 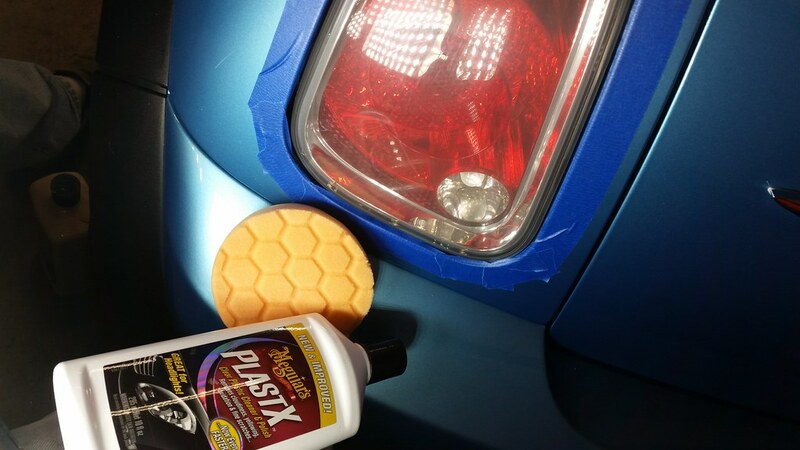 The only thing I will use the clear material for is to protect the headlight plastic on the blue car after I polish it clear (and with that remove the factory UV protection). Meanwhile ECS Tuning is again selling me stuff they don't actually have in stock (my Milltek exhaust took 3 months to ship): exhaust hanger and mounts were ordered May 17, estimated delivery June 4-6. So much for working on the car next weekend. Guess I will swap cars in the work space and do the engine damper of the blue car first. I was thinking if I ever found a car in a color I don't like but otherwise checks all the boxes, I'd wrap it in a different color. 4-5 years and $1k in material isn't such a bad gig and I am sure it'll protect just as well as the clear stuff. Agreed - this is the way to go there. I've seen some wraps you could not tell were not paint.. its getting better and better. While another layer of paint was drying, I got busy removing a decade of scratches and decay from the tail lights of the blue and dark silver car. Made a lot of difference. Lots of scratches in the plastic before, now all gone. One light is still a bit hazy, probably on the inside. Not sure I can open them in an over. $85 or so buys a new one, but I'd need two to have a match. It's really not that big of a problem - have many more pressing issues. Under hood liner for example - the one on this car is in rough shape. When your done I can send you a Red mine to shine up. I told you to send it to me, it’s only money. @Dave.0 You may be getting it. Its is bad the Molding looks bad the rear window has film on it that I cant get off, rock pecks on the front, now its not running right. I am about to shove it in the garage ant start working on it. But First if the Helmet is going to sit in the hot summer sun I have to get the paint and vinyl protected. When things calm down you will be getting a PM about how to do that. Ok Lee, let’s talk later and stop hi-jacking this thread. I already have a chili red one to work on. 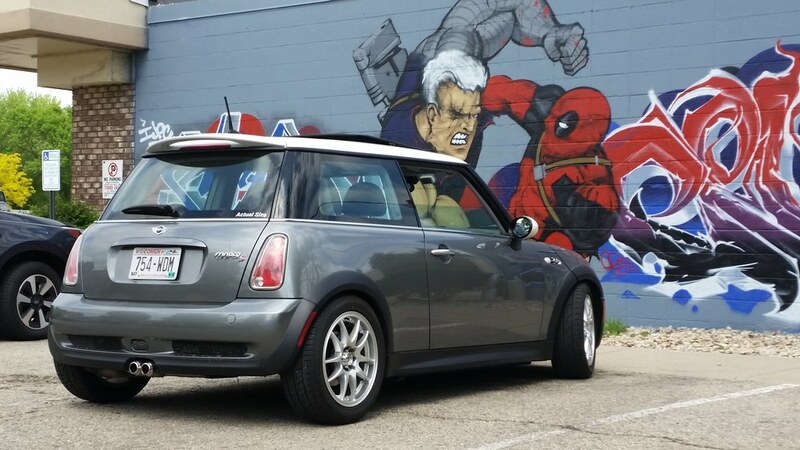 However, pepper white or dark blue R53 models are welcome to be abandoned in my driveway, especially JCW with low miles and prior obsessive care given to it. I finished up the rear scratch last night. Sanded off the ridge of dark silver that fills the scratch with 1200/2500/3000/5000/7000 grit until I was leveling clear coat, then cutting compound and final polish to get it shiny. Some wax over it for now. With harsh lighting you can clearly see the line, but much improved. In indirect light, 10 feet away, you cannot see it any longer. 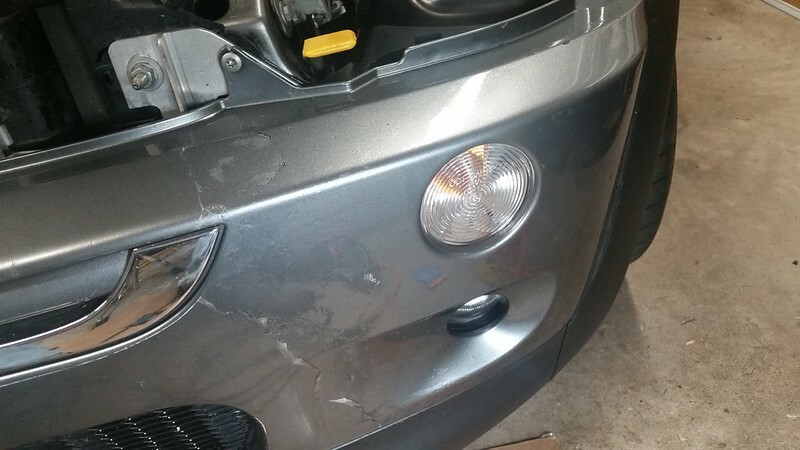 The gouges I put into the front bumper while removing the clear bra will take some more paint to fill the holes, but eventually will get the same treatment. And a brief update on the LED lighting. 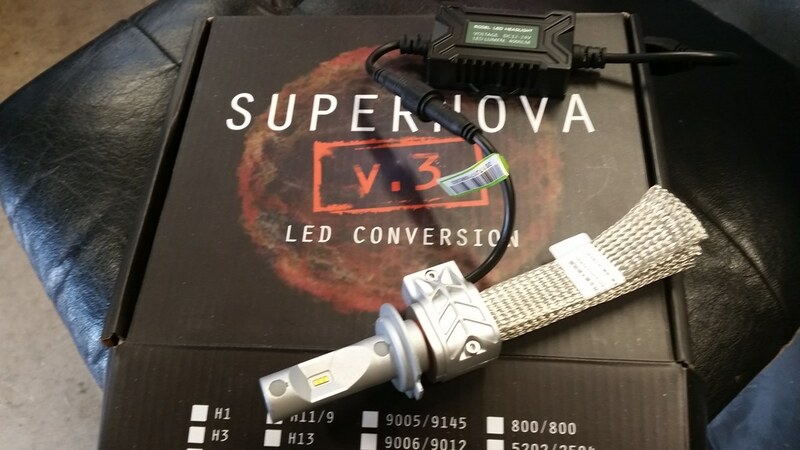 I've used NCS Expert on this car as well, coded out all the bulb checks that make LED exterior bulbs flicker randomly, and then tested the latest and greatest LED H7 in the low beam position of this non-HID car. Very impressive, much brighter, but since it's not a projector like the HID car I have, the extra light is all right in front of you, almost too much of it, while the ditch seems to be darker due to the increased contrast. I like the gain in brightness, and it comes without the usual glare issues known from HID kits stuffed into reflector housings. 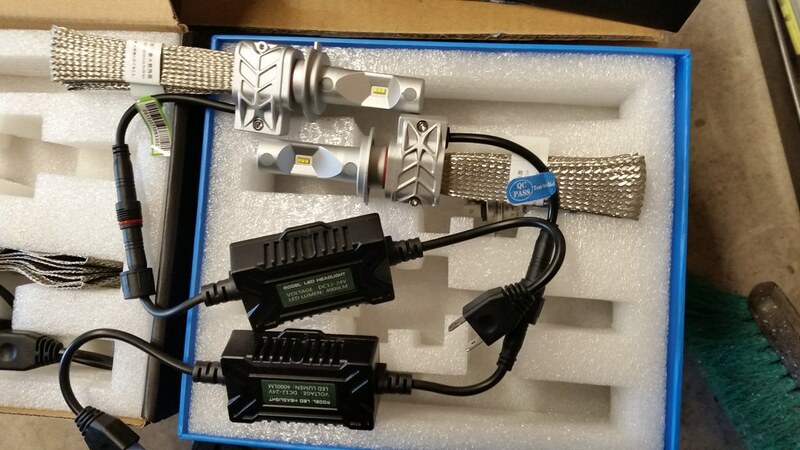 Still not as clearly defined as an HID cutoff, so I am pretty much decided to buy a full complement of HID projector conversion parts for this car. I will use the LEDs in the high beam position as soon as I figure out how to stuff the driver into that part of the housing. It fits loosely below the low beam, so much that you need to wrap it in foam to avoid clunking sounds, but around the high beam, there's not much room. Should all be easy to resolve when I crack these things open. Found these after I saw a review of LED bulbs and paid quite a lot of $$$ at one of the big retrofit outfits in the country. A month or so later, I spotted what appeared like a clone of the bulb. Figured it's Amazon and I can return it if it doesn't come out to be what I expected, but, well, it is totally identical, just a different box and less than half the price. I don't even know which one of the two bulbs in this image is the SuperNova and which one is the no-name Amazon bulb but I guess the blue tag one is the cheap bulb based on the above image which was taken before I got the Amazon bulbs - look for "Vouke VH-5S H7"
Yea he is working it over.. has a number of good build threads.